Passover countdown . . . Since I’m totally submerged in Passover – I thought I’d keep you updated on what it’s like to work in the kosher biz during the busiest time of the year. The kosher biz. By this, I mean that I (along with my parents) own and operate a store in Winnipeg that sells only kosher products (and gifts!). We also prepare food, though not under any kosher supervision (all of the ingredients are kosher, and we follow the laws, but are not officially kosher). First of all, the planning started the first week in January. Tentative product lists started arriving from various suppliers in Eastern Canada. I’d already been thinking about my orders since September – so I was ready to go through the lists. For a few weeks, most of the workday and evenings at home were spent going through the lists to see what was new and what wasn’t being offered this year. I spent hours and hours guessing at numbers and typing up orders. Phone-calls to various suppliers to check on things. Questioning customers about what they wanted. All orders have now been sent in except for the final dairy order and some of the meats. About a week and a half ago, the first of the Passover products started trickling in. We have chocolates and olives everywhere! The big orders will start arriving in a week or so. For those of you uninitiated, my little food store (I carry approximately 1200 items) is completely turned over for Passover. 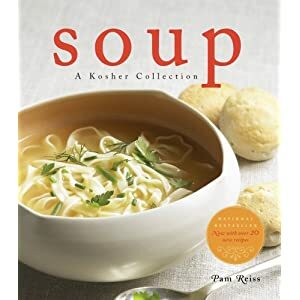 Right now I’m trying to sell out items and let stock go down – because anything not kosher for Passover has to be sold or boxed up and put away in the next couple of weeks. For Passover we’ll be stocking approximately 900 items – that’s 900 different items than the ones I carry the rest of the year. Last week we started panicking. Where were we going to put 3000 lbs. of matzo when it comes in next week? Do you have any idea how much space 3000 lbs. of matzo takes up? In a moment of brilliance, I called a storage company. On Monday we’ll be received a 40′ X 8′ storage container that we’ll keep in the parking lot for a month. So all the dry stuff (matzo, matzo meal, cake meal, potato starch, farfel, chips, etc.) can go in there. If it would just stop snowing, it’ll be much easier to get things from the parking lot to the store. To add to the craziness – I’m waiting on the arrival of a new, programmable cash register system. So every item in the store will need to be programmed into the system before it can be put on the shelves. I’ll try to bring my camera to work and show you the progress over the next few weeks. It’s going to be a crazy month!